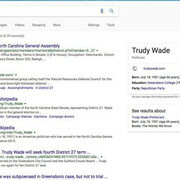 A photo of North Carolina State Senator Trudy Wade appeared in Google's Knowledge Panel with the word 'bigot' written across the bottom. 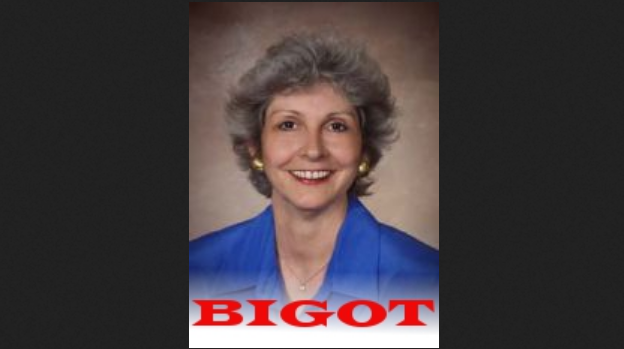 The photo that appeared on the right side of the page, first reported by Vice News, showed a photo of North Carolina State Sen. Trudy Wade with the word "bigot" written in red capital letters under her headshot. 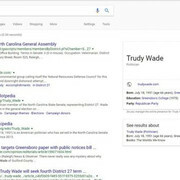 The image result was removed later in the day, as a search of Wade’s name only provided her website, some brief background information and her party affiliation. Wade said in a statement that after the controversial photo was discovered, an aide asked Google to remove the picture. “She was told to find and contact the original author of the photo, and the post stayed up,” the lawmaker explained. It must be “user error”. Google is unbelievable. They have no shame about the liberal bias. Quickly? Who are they kidding? Wade represents North Carolina’s 27th district and has held the office since 2013, according to her website. Wade said Saturday that Google’s alleged response was “disconcerting” considering a similar issue they’d had only a day before. The error was later fixed. A Google spokesperson told Fox News that it was likely the result of vandalism on one of its sources. Google is blaming "vandalism" at Wikipedia for search results that incorrectly said the ideology of the California Republican Party included "Nazism." My opinion - People keep searching for detailed corruption on election interference and here it is folks. The media left-leaning biased circus has now gone too far. They are stealing the election by allowing this slander of conservatives to continue. If President Trump doesn’t put a stop to this conservatives will lose our voice completely. Roseanne was the latest victim. Yes, I said victim. We see liberals saying much worse than she did with no consequences. Do I think they should have consequences, yes, and please allow me to explain. Although I do believe in the First Amendment with all my heart and do not agree that it should be bartered or chopped to pieces, there are times when you can’t just say what you want to say. There used to be a time when you couldn’t just “ruin” someone’s career and their livelihood by saying anything you want about them regardless if it is true or not. People could and would sue on the basis of defamation of character. Since the days of Twitter and all social media outlets, there have been no real boundaries set and the sites are governing their own set of rules, which are biased against conservatives. This will not stand. It will affect elections and it will and does affect people’s personal and professional lives. President Trump, I appeal to you to make this an important goal. Stop the liberal biased media in their tracks. Make them have consequences. I am so sick of these anti-American communists operating right out in the open with impunity. They don't seem to be concerned at all about reprisals, at all!! I would like to go on recorded as saying, neither one of these cases was an error. I believe they were deliberately done by Google employees. The Republican Party of CA and this NC State Senator should sue Google. Yes, I agree we have freedom of speech. However, that should not be extended in cases where Google outright posts false information in an attempt to sway elections. Google used to be a trusted site. That is until Obama passed his law allowing Propaganda to be dispersed. I believe he did this knowingly so he could once again weaponize against Conservatives. While the Left is pushing Communism- we need to step up our game and fight against their smear tactics.